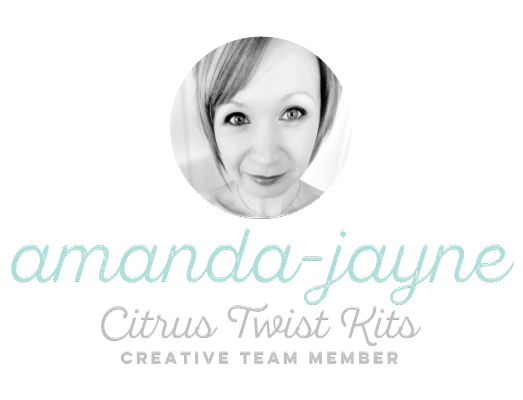 Citrus Twist Kits | Blog : Life Crafted LOVE with Amanda! Amanda here, and boy oh boy have I been having tons of fun with my new Life Crafted Album! 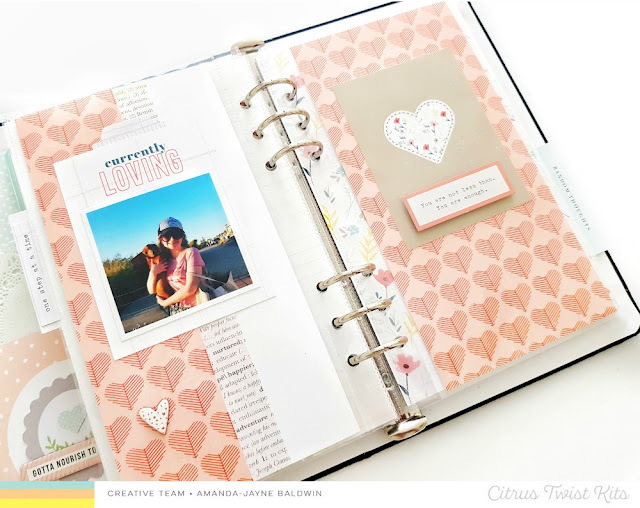 The new February Life Crafted Kit - Love Stories - is all kinds of awesomeness! From pretty pattern papers to the divine ephemera & even the acetate shapes, this kit has my heart! Missed my first post with the opening "Getting Started" pages? You can check it out here. CTK Supplies: Life Crafted January Fresh Starts Kit & die cut ephemera from February Love Stories Kit. This month I have been able to really embrace how Life Crafted is going to work for me & my stories! You'll see that I have now divided my album into 3 key sections: A Beautiful Life - memory keeping & story telling, Give Yourself Time - dedicated to self care and personal growth, & Random Thoughts - fun, random bits n pieces from daily life, as well as a bit of creative play. It's kinda like 3 albums in one, which will grow & develop as the year unfolds. 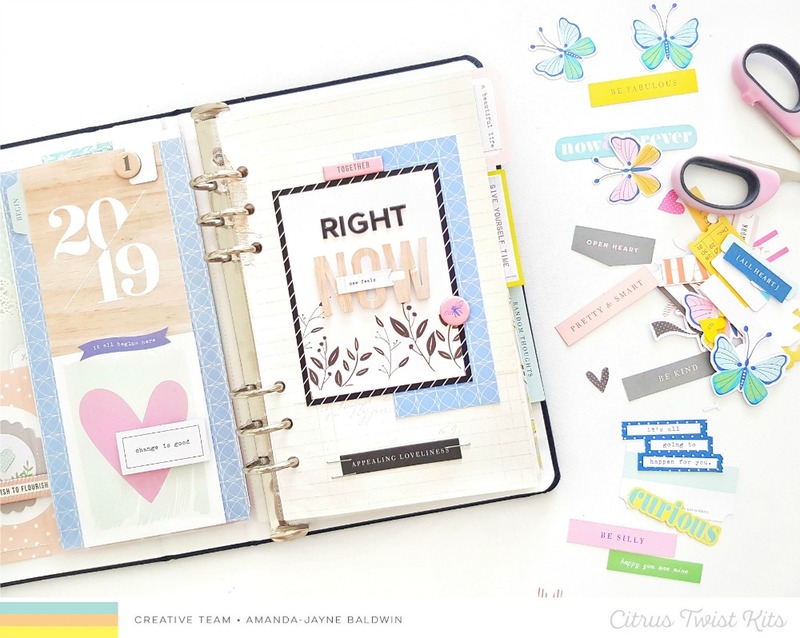 I used my January Fresh Starts Kit for this, and then continue to mix and match the two kits because the kits have been so beautifully curated that everything coordinates together perfectly! 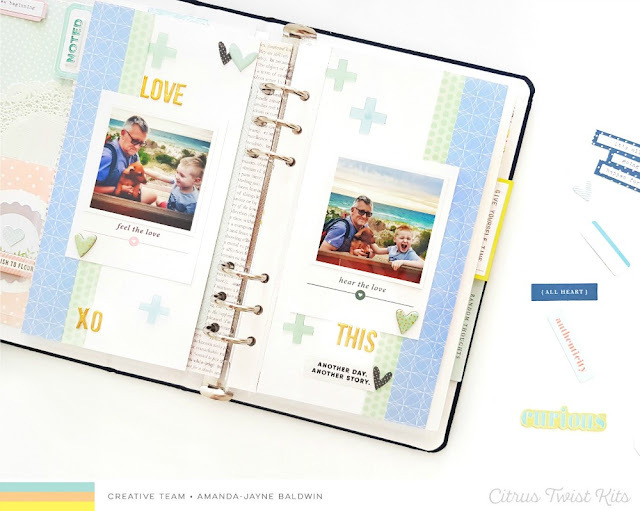 My album will be an eclectic mix of scrapbook pages, pocket pages, traveler's notebook spreads and all things in between! Ultimately, it will become a beautiful mini album that reflects me & my stories! Perfect! CTK Supplies: Life Crafted February Love Stories Kit, Life Crafted Album - black. This IS my why! Such a treasured memory, & so beautifully documented. Love the soft color palette & the gold foil accents. On the left hand side of my album, I have a more traditional scrapbook style page with lots of pretty layers & embellishments. I trim the pattern paper to a 5" x 8" size, and hole punch the side so it fits into my ringed binder. To the right, I have created a more TN / pocket style page - doing things my way & loving how it looks! The stamps included in the Love Stories Kit are amazing! I use them subtly on both pages. CTK Supplies: Life Crafted February Love Stories Kit, January Life Crafted Fresh Starts 6" x 8" Pattern Paper. For these pages, I mostly used the February Love Stories Kit, but I also added in the powder blue pattern paper from the January Kit. The 3" x 4" cards were perfect for these fun photos of my husband, son & new puppy - just look at the facial expression on my son, hear the love, indeed! 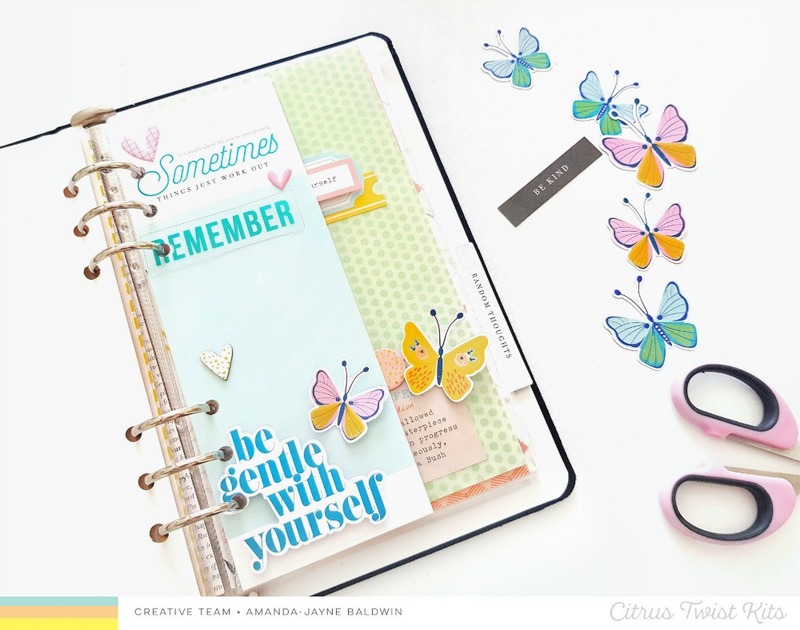 The die cut acetate shapes in this month's kit are such a fabulous edition too! CTK Supplies: Life Crafted February Love Stories Kit, black puffy alphas from the January Kit. Nawww! Another wonderful moment documented! So sweet! I have mixed up my memory keeping style again & I have to say, I am having so much fun! The 5" x 8" title page is a fave of mine, & I love the mix of the January black puffy alphabet stickers with the February ephemera & acetate shapes! I loved the bold colors, but as most of my album will be soft & full of pastel pretties, I used plain white paper as my base. The white helps to balance the yellow & red, and adds a 'clean' look to the page. Best part, it looks gorgeous and I documented it in minutes! Life Crafted is fitting memory keeping into my busy life! LOVE! CTK Supplies: Life Crafted January Fresh Starts Kit. Ga ga gorgeous! Nothing says self care like encouraging affirmations! That pattern paper is totally swoon worthy! 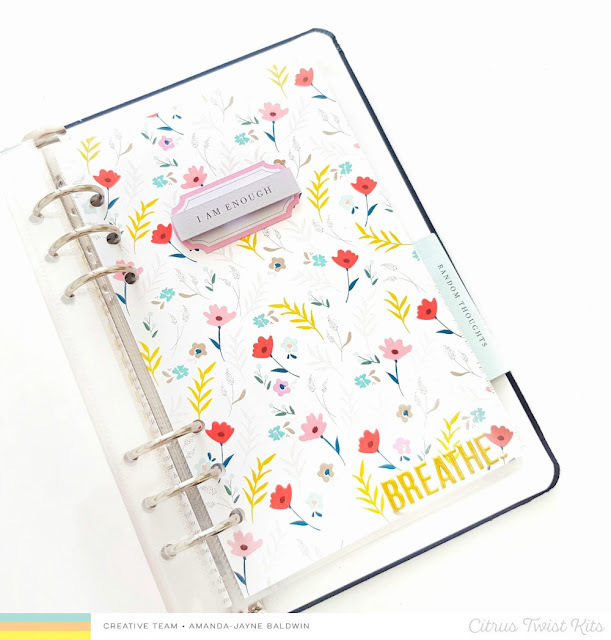 Each month the Life Crafted kits include an exclusive 3" x 8" book mark & this month's was perfect for my self care album! I embellished mine with die cut ephemera & acetate shapes as well as foiled chipboard & puffy sticker hearts! (All are from the Love Stories Kit). Sigh! SO pretty & so heartfelt! A little reminder to self kinda page! Tip: To keep the dimension of the die cut butterfly wings, I adhere the butterfly onto the outside of the pocket, not onto the paper. This prevents bulging, out of shape pockets and looks just as effective. 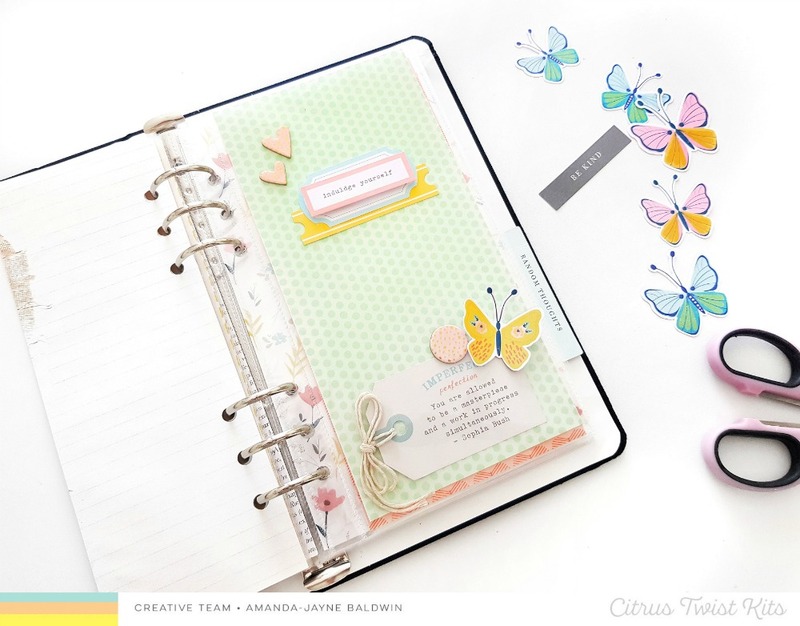 CTK Supplies: Life Crafted February Love Stories Kit. Nawww, puppy love & evening beach walks! My best Summer, right here! This makes my heart happy! As soon as I saw the I AM ENOUGH label, I knew I wanted use it for the closing page of my Give Yourself Time album. I foam mount it onto a pretty pink label,& that divine floral paper. Pretty! I also add one last reminder to self...Breathe! Those gold puffy alphas are errrrrything! How fun is this?! Bright, colorful & creative play! Love it! Life Crafted - my album, my stories, my way! I hope you enjoy watching and please press the subscribe button for future inspiration! 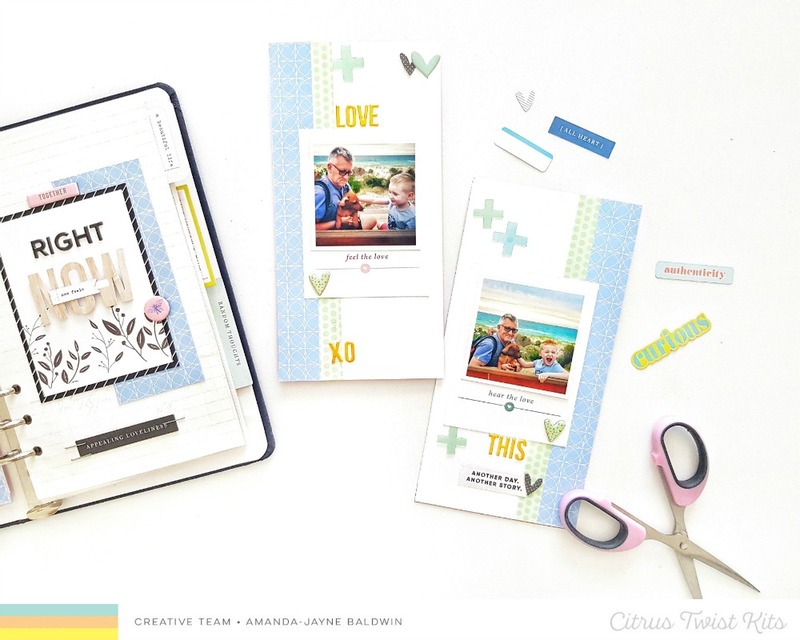 I hope I have given you some ideas for how to use your Life Crafted Album & Kits!